Dear Doug, We would like to take this opportunity to share with other landowners, the extremely valuable legal assistance provided by Attorney Douglas A. Clark in dealing with Marcellus Shale issues over the past two years. He first negotiated an excellent lease with Cabot Oil with a no surface disturbance clause. Subsequently Williams pipeline cut down many trees on our property by mistake when preparing for a pipeline along our border, Attorney Clark negotiated a more than fair settlement for the damages very expeditiously. We recommend Attorney Douglas A. Clark to all landowners who are in the process of dealing with Gas Lease and Pipeline companies. He will negotiate the fairest contracts that are possible and the peace of mind is worth every fee that is charged. PS: Thank you again for your service. The Clark Law firm was terrific in helping us navigate our recent pipeline agreement with Susquehanna Gathering Company. Many people do not consider the ramifications of the complex legal language of the documents they are signing when entering such agreements. Doug was extremely helpful in helping us sort through the legal language to help us get an outstanding agreement that will benefit and protect us. Most of all, my wife and I truly appreciate all the help and assistance you have given us over the past year! Whenever anyone asks about legal advice for anything related to natural gas exploration, we ALWAYS refer them to you! You are the BEST! Even though we felt that our own negotiations with Williams had resulted in a fairly good preliminary agreement, my husband and I realized that “we don’t know what we don’t know.” So, before signing, we knew we should consult a professional about the proposed pipeline right-of-way across our property. The two most important things to us were the need to protect our property’s value for our own family’s future use, and also the desire to maximize the compensation we would receive. 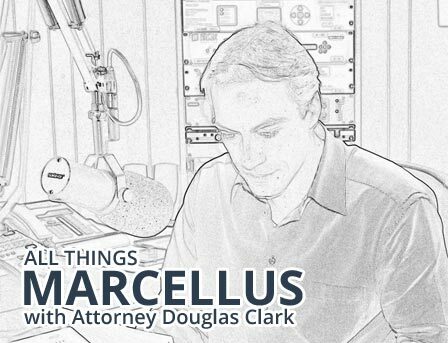 Through listening to his radio program, we knew that Attorney Doug Clark was extremely knowledgeable on the subject and well positioned to negotiate on our behalf. Without a doubt, Attorney Clark was the right choice. The final agreement he was able to produce gave us all the protection we needed but hadn’t even thought to demand, and also more than doubled the compensation we received. We found him always willing to give advice but never pushy, leaving the final decisions up to us in every case. He was always a pleasure to speak with, willing to patiently explain the issues, and quickly responsive to our inquiries, as was his staff. The whole process was pleasant, and I would highly recommend that anyone who is in the position to negotiate a pipeline right-of-way consult Attorney Clark.